Probably the nicest still from the piece of film. 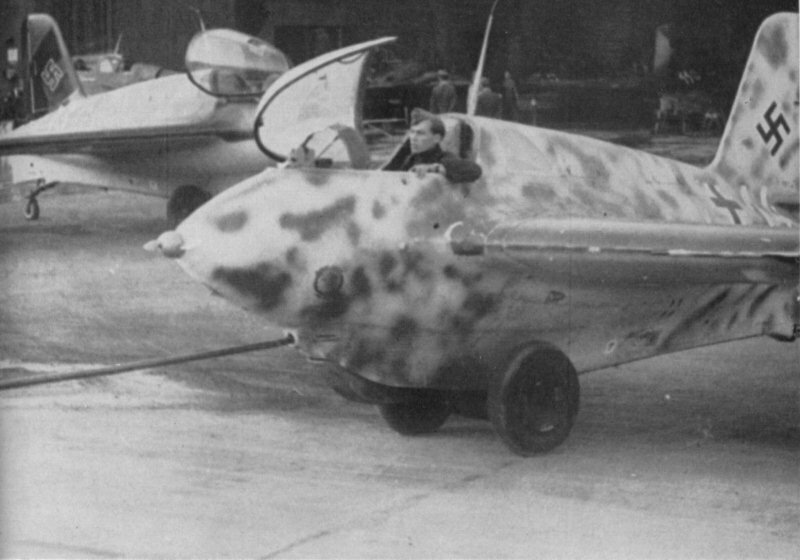 It shows Komet 'White 14' towed further along the hangar, showing off the interesting contents of the hangar. From right to left: 'White 11' as seen in the previous still, 'White 7', then two unknown Komets and lastly 'White 13' in the foreground. 'White 13' appears to have a severe glare over much of the upper fuselage, making it appear light grey. If this is not a glare, than 'White 13' is by far the Komet with the strangest camouflage. 'White 14' in the mean time shows its mottle camouflage in great detail in this picture. Interestingly, it also has a BSK 16 gun camera installed in front of the glass armour. Vaguely visible is the short tube in the forward edge of the canopy that connects to it. Lastly, a small opening inboard and above the left gun port can be seen, which housed the boresighting unit for the MK 108 cannons.